I can’t believe the Holiday season is already here. Christmas is my favorite holiday…after of course my Birthday… but I refuse to do anything for that holiday until after Thanksgiving. I think sometimes Thanksgiving gets over looked and put in the shadows a bit because Christmas decorations and other items come out in the stores so early. I think Thanksgiving deserves its own excitement and hipe, so I share with you today some of my favorite Thanksgiving themed tablescapes and other details to spice up your thanksgiving and show that you are thankful for Thanksgiving. 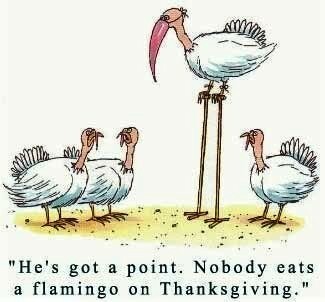 The Thanksgiving holiday usually has a lot of family tradition wrapped around it. Most families have the same recipes every year and everyone looks forward to those one or two special dishes that they only get once a year. Because of this you usually don’t want to mess with the food and recipe aspect at your thanksgiving gathering, but sometimes you want to make each year new, fun and exciting for your family. 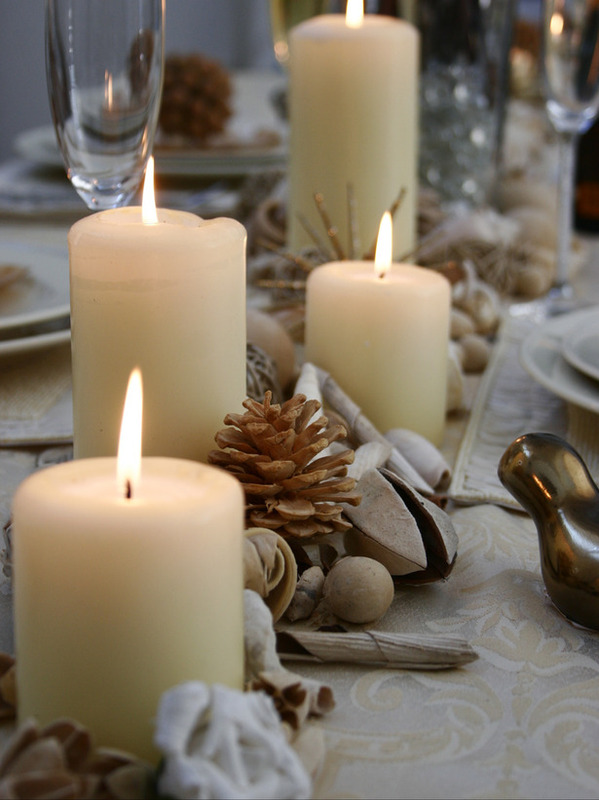 One great way to do this is to change-up your center piece or tablescape each year. 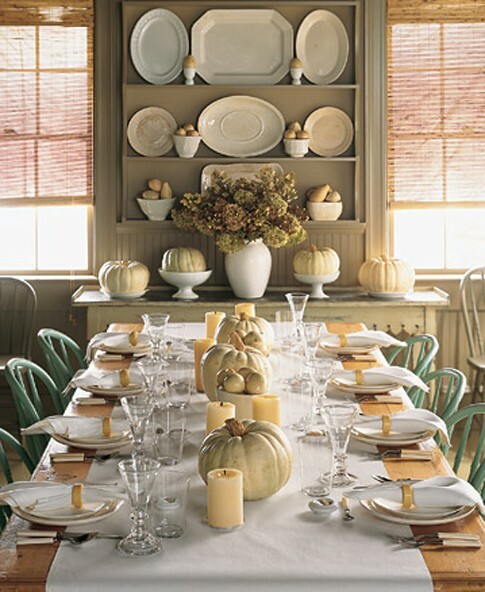 There are so many beautiful ideas out there that show a fun thanksgiving/fall theme but are not to “themey”. Below are a couple of my favorites that I’ve found and a lot of the items in these photos I bet you either have around your house already or can find at any store from Target to Crate and Barrel. I love this rustic fall looking centerpiece from HGTV’s website. The pine cones and decorative sticks add a rustic flair but the candles mixed in make it warm and inviting at the same time. I would even add some higher and lower candle holders to add some more depth to it. And how about this simple yet beautiful table setting above and seen here. The white pumpkins and candles down the middle are so sweet and I love the slight color brought in through the napkin rings. 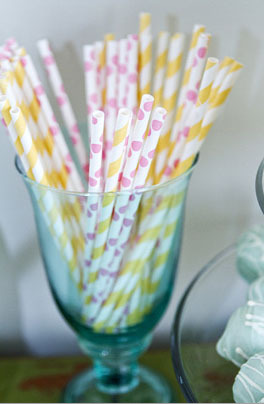 You could also bring a fun color in with this center piece by using colored napkins (see the place card napkins below). Simple, chic and beautiful. 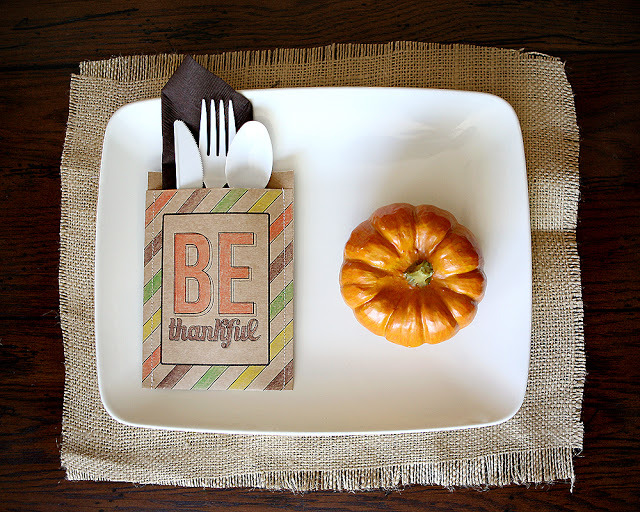 Here are some other fun ideas to spice up your Thanksgiving! Look at this adorable and fun utensil holder. You can download the template here. 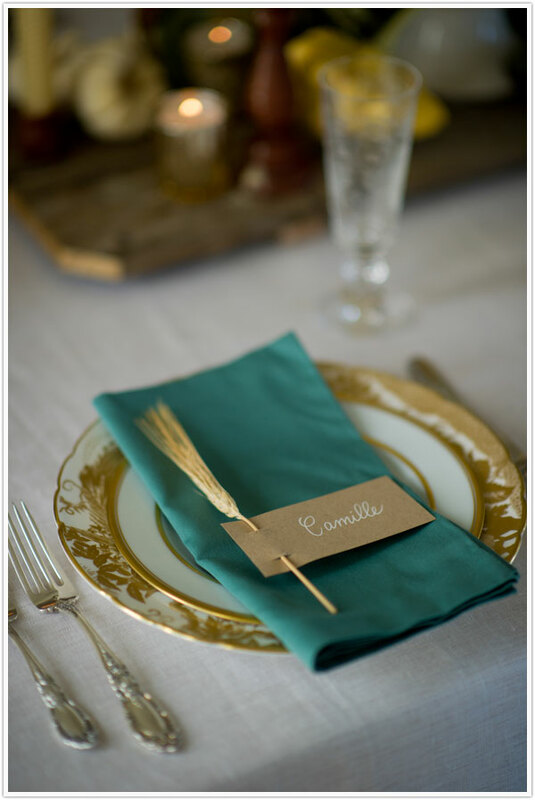 This is a fun and festive way to do place cards. Use a seasonal item to attach the card to, like the sprig of wheat shown in this photo and here. I love when guests come to visit and we get to entertain them all weekend. One of the most important parts of entertaining out of town guests, and I know my fellow entertainers out there will agree, is having an agenda! 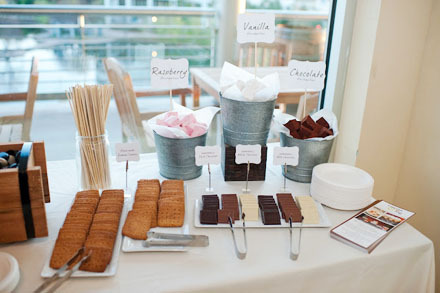 Having a plan is key, that way your guests can just sit back, relax and let you lead them through the weekend. They are on vacation…they shouldn’t have to think about anything. We were lucky enough to welcome and entertain my in-laws last weekend. The Hubs’ Mom, Dad and Sister came to visit. From the day they planned the trip I have been thinking of fun things and great restaurants to visit while they were here, so by the time they got here I had the whole weekend planned out and I was ready to entertain! They were able to enjoy their weekend, not having to think about a thing. We started with dinner at Grey Goose in Southport. It was a great first night dinner. We went straight from picking them up from the airport so we wanted a casual and laid back place with great food. Day 2: I had to work so the Hubs and his family got some time together. After work though, us women were able to pamper ourselves with a Mani/Pedi and then went home for some great appetizers and wine. That evening we went to dinner at a new restaurant in the area, The Chelsea. It is fabulous! Such a fun dinner experience and great food. Day 3: I planned a boys vs. girls day for Saturday afternoon. The women worked hard spending lots of money on our fabulous fashion finds in Westport while the men slaved away on the golf course. We met up that evening at home to enjoy a home cooked meal of my father-in-laws famous Ribs, mother-in-laws famous Mac & Cheese and of course a glass of wine or two! Day 4 turned out to be a beautiful crisp fall day, so what better to do than to go pick some Apples. We traveled to a beautiful orchard in northern CT and enjoyed a day of apple and pumpkin picking. The rest of the day was spent eating, lunch at the famous Bar for some New Haven style pizza followed that evening by dinner with a beautiful water view at Splash. 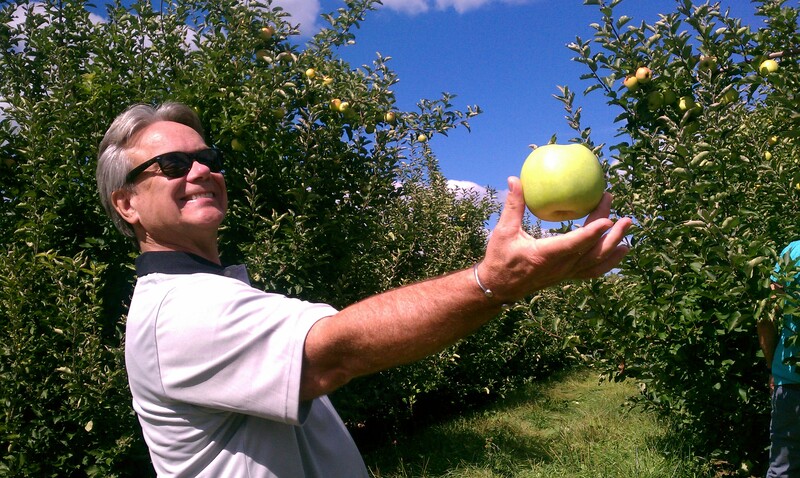 My Father-In-Law with the perfect apple! 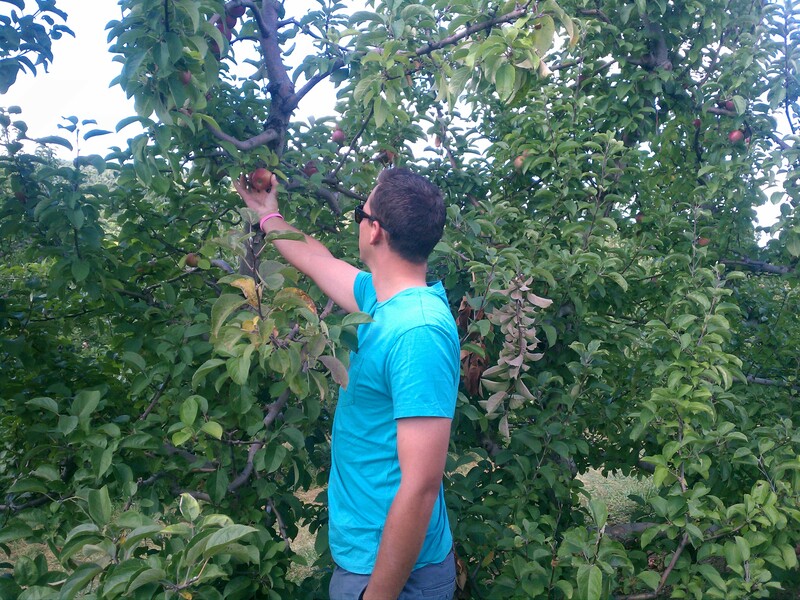 The Hubs getting his apple picking on. We had such a fun weekend of talking and laughing with some of our favorite people and were sad to see our family leave after the fabulous weekend! I can’t wait for the next out of town guest to come so I can start planning again…who’s it going to be?! This shower was so much fun to plan that I had to split it into two posts. 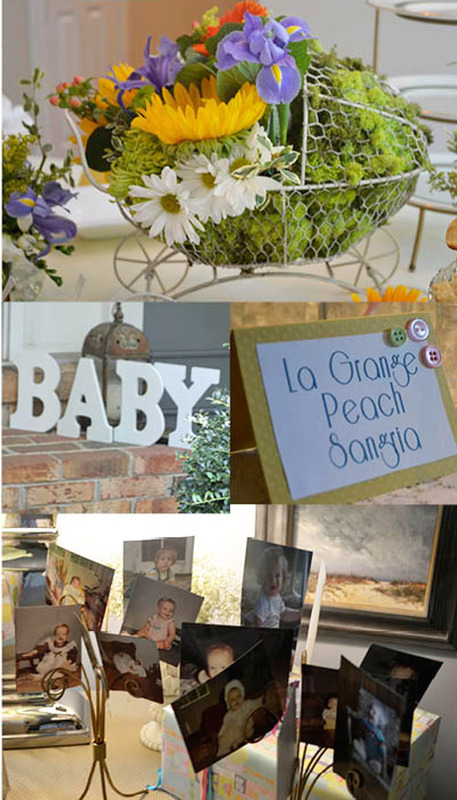 As you saw in the first one I shared with you the fun theme, cute decorations and meaningful details. 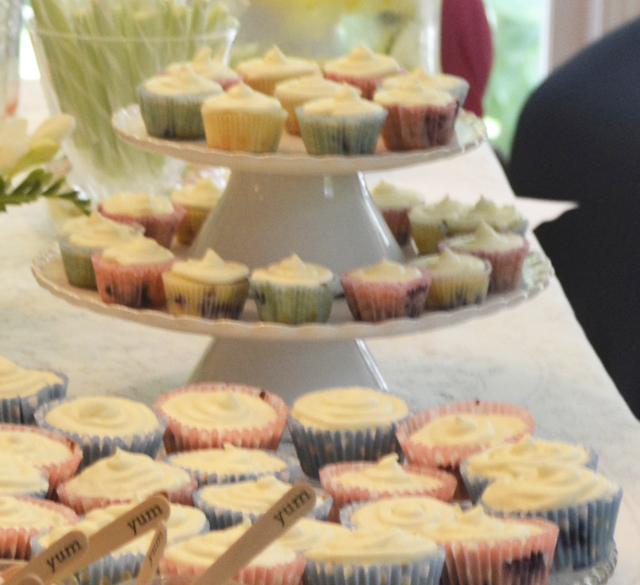 We also had some great food served in some fun ways. 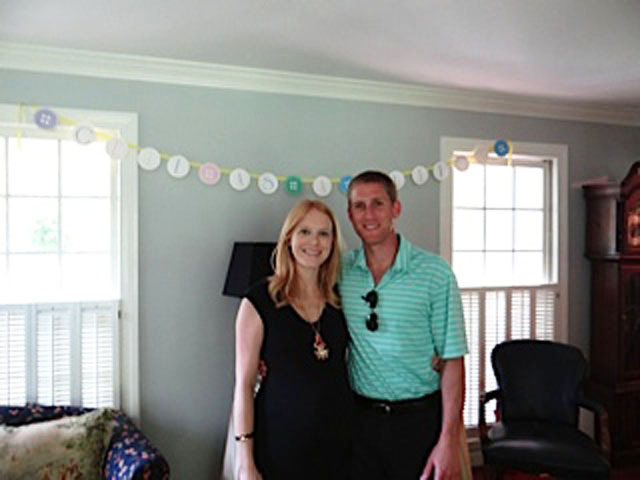 Most all of the food was homemade and chosen based on some of the mother to be’s favorite brunch foods. 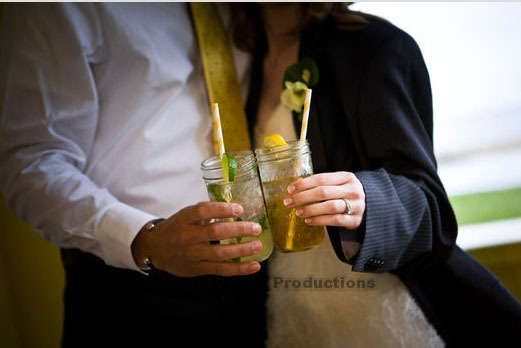 The shower started with some specialty drinks served as the guests arrived. 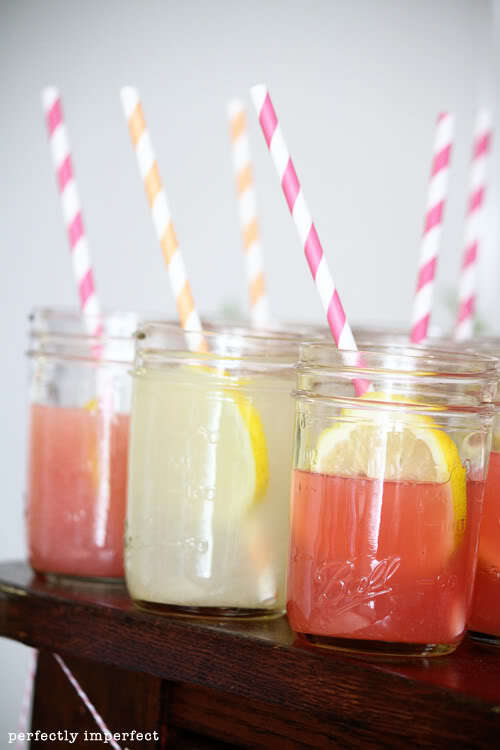 It’s always fun to pick a couple of fun drinks to serve that match your theme and color scheme and then also offer the basics like water, tea and coffee. 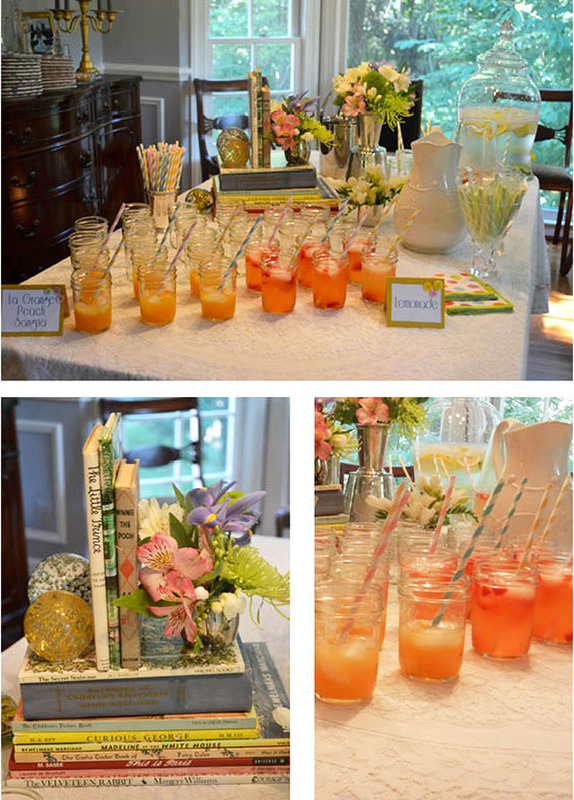 The two drinks that were served were Peach Sangria and Strawberry Lemonade. The Strawberry Lemonade was non-alcoholic so that Lindsey could still enjoy a fun mocktail. After some mingling guests moved to the kitchen to enjoy brunch. 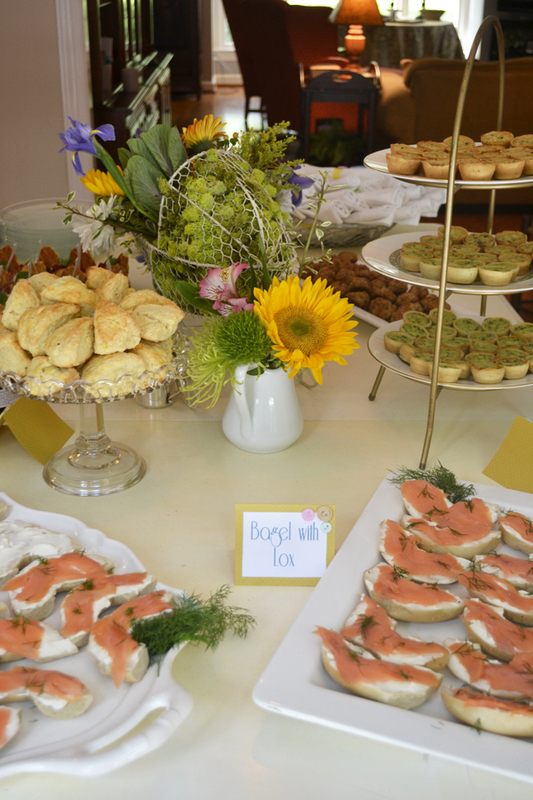 The menu included: Fruit Cups, Scones with Strawberry Jam and Whipped Cream, Bagels with Lox, Quiche and Sausage Cheese Balls (a family favorite). 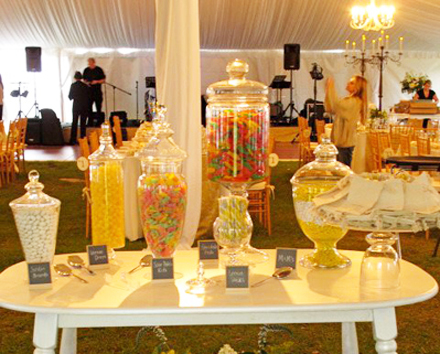 All of the food was bite size and finder food which was great because it cut out the need for everyone to juggle silverware. After Brunch guests picked up some dessert to enjoy while Lindsey opened her gifts. 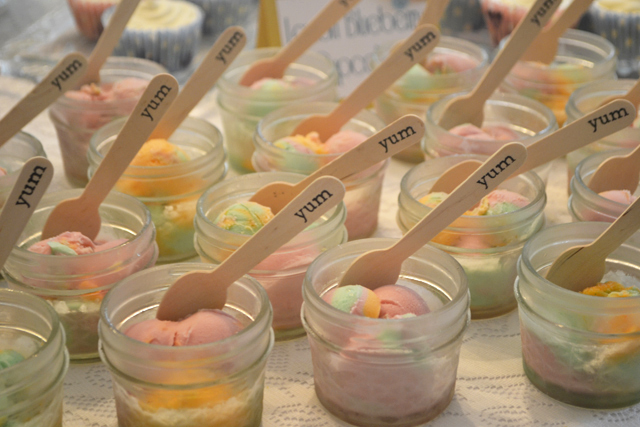 Dessert included Lemon Blueberry Cupcakes and Rainbow Sherbert served in these adorable mini mason jars with fun wooden spoons. 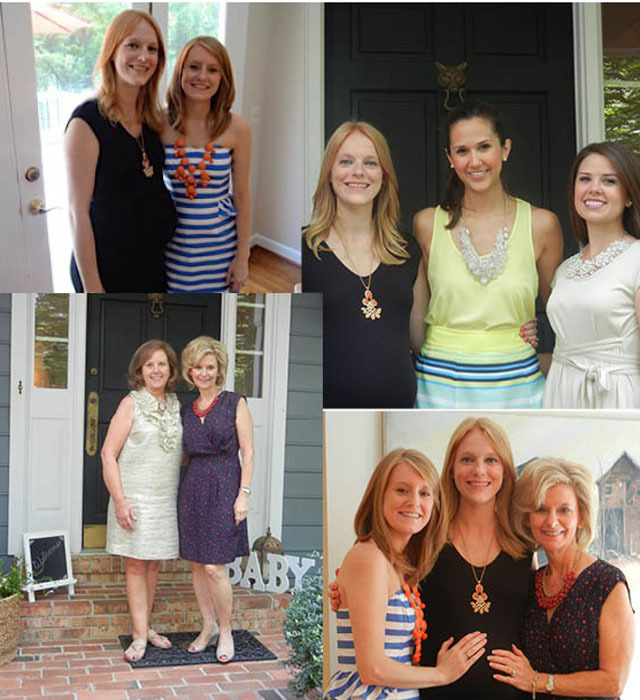 Lindsey got some great gifts to help her for when Baby G arrives. 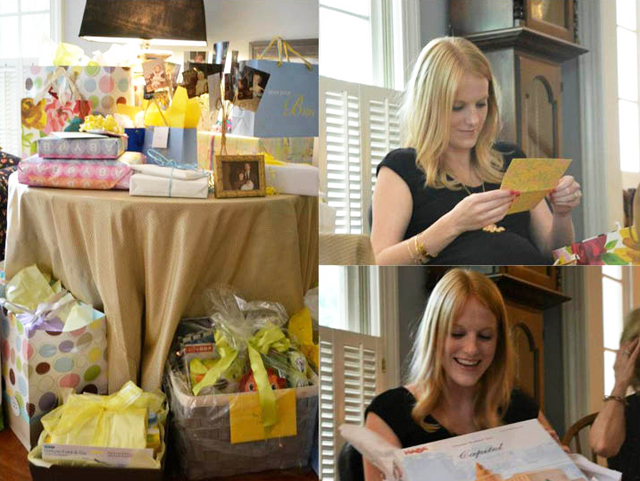 Thank you to everyone who attended the shower and to Lindsey for giving me a Neice or Nephew! 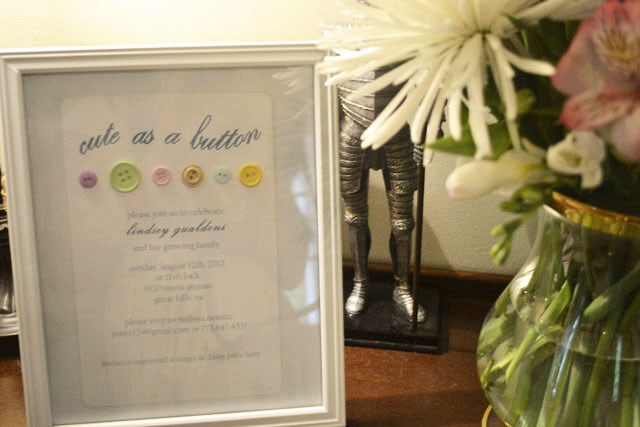 When planning an event, anything from a small dinner party to a larger gathering of friends, my favorite place to start is by creating an Inspiration Board. This is a time where I can explore my creative ideas and imagination. I usually start by looking at blogs, books, fabric, etc. to start collecting photos, color swatches, designs and other things that inspire me. Once I have all of my items together I start to arrange them either in a creative software on the computer or if they aren’t photos on the computer I clear a space in the living room and start laying all of the photos and items out. By doing this a theme and usually a color scheme starts to build and you also realize some of the things you have in front of you don’t go together or fit together well. Once you separate out all of the inspirational items either post them on a board together or print it out to have. 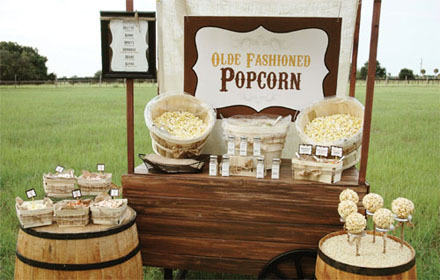 Building an inspiration board will help you get your thoughts together and streamline your vision for the event. 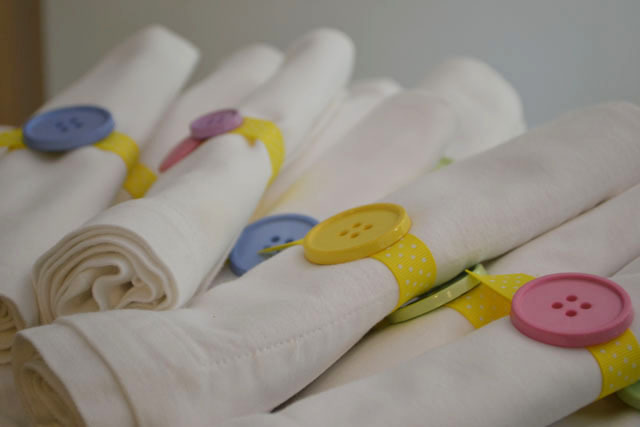 Carry around your board, or at least a photo of it, while you are shopping for decorations, picking out flowers and any other planning trips that you take so that you will know you are staying on point with the vision for the event. What does an inspiration board look like, you ask? Well it’s your lucky day because I have examples of some inspiration boards below. 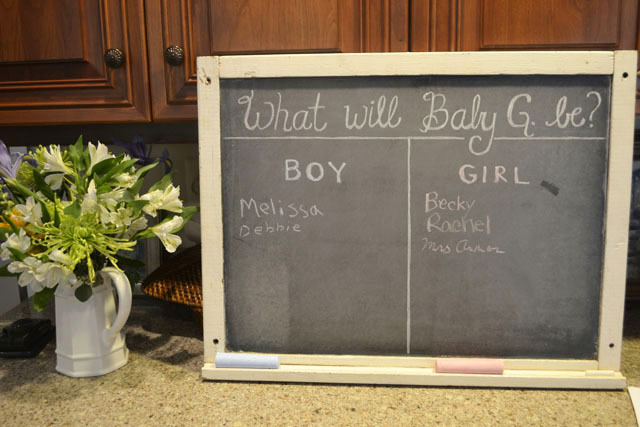 First, is the one that I built for the baby shower I’m throwing for my Sister. I will be talking a lot more about the shower and different ideas and planning details later, but here you can see the inspiration that I am building off of. I started with so many different ideas and themes but by making this inspiration board it helped by hone in on my vision for the shower and come up with some great ideas. It helps me keep my thoughts and ideas organized. If you are like me when you are planning you think of so many great ideas but they are at opposite ends of the spectrum. You have to wrangle the creativity in a bit and decide on one vision and the inspiration board is a great way to do that. 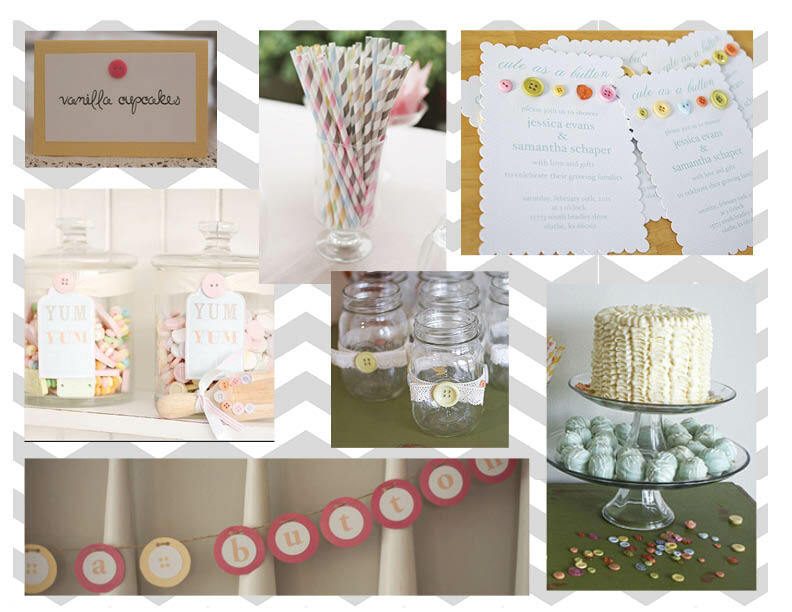 This beatuiful board from Canvas & Canopy Events‘ blog shows the color scheme, patterns and look that they are going with for this event. You can tell right away from looking at this exactly what the feel and style of the event is going to be. 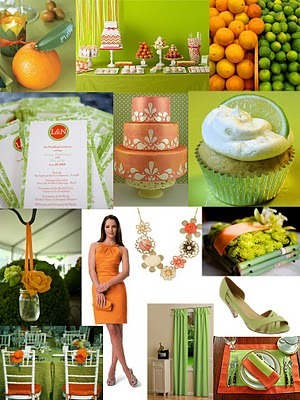 Beautiful inspiration boards like this make me want to be a guest at these events! 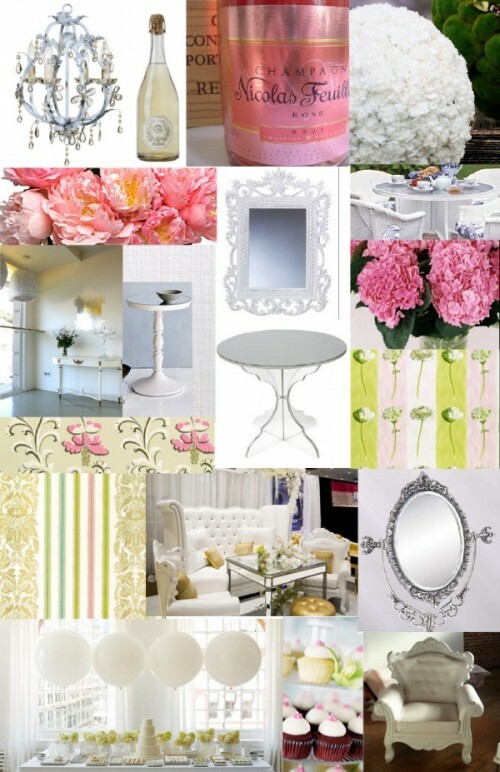 Here is another great Inspiration board from Paper Doll Romance blog. This board is very specific on the color scheme for the whole event. 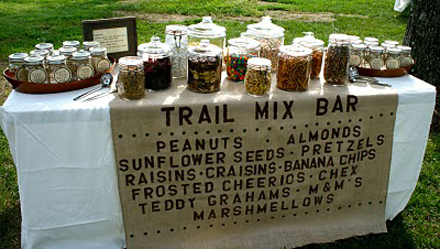 This will really help the planner and all of the vendors stay on the same page with the colors of every aspect of the event. This is a great example of picking actual items, like the fruit at the top, to base colors off of. It’s something that everyone involved in the planning process can relate to and envision right away in their heads. 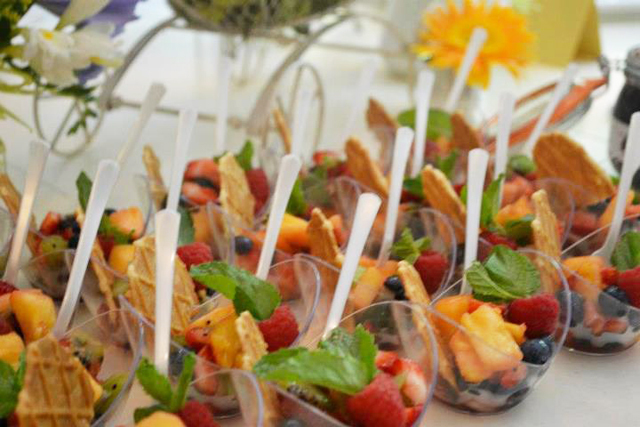 Hope this got you inspired to start creating your next event!